“You guys wanna do a craft? !” my wife says to the kids, just as we finish up another exhausting family dinner. My children, who, for the last hour or so, have been whining and complaining about their food as if it were cough-syrup-covered cockroaches, suddenly spring to life and yell out in joyous approval. Fun? Happy hour is fun. Going to the movies-—fun. Embarking on a complicated construction project with a rambunctious 2-year-old and a 4-year-old drama queen…yeah, sounds like a real hoot. Apparently my wife found a craft in Disney’s FamilyFun Magazine and then downloaded the directions online. The final product was to be an elaborate cardboard tree house, “perfect for nature-loving peg dolls and fairies,” according to the description on the magazine’s site. Personally, I’ve never met a “nature-loving peg doll” and/or fairy. But then again I’m sort of a homebody. The craft looks simple enough – an obvious red flag – and so I decide to play along. 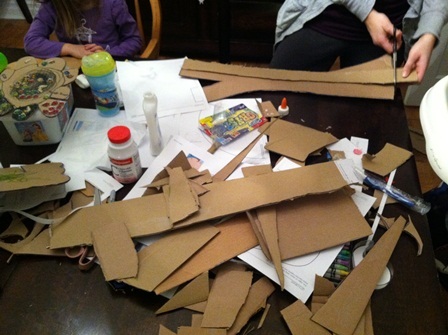 As I go down to the basement to get some cardboard boxes for cutting, my wife and the kids clear the table to make room for some serious crafting fun! Fifteen minutes into the project, my hand is already cramping from cutting the four long cardboard pieces for the trunk of the tree house. I’m a writer, for cryin’ out loud; I’m not used to this type of physical labor. It’s also around this time that my daughter decides that she’s had enough “fun” and leaves to go play with some real, already assembled, store-bought toys. My son is nowhere to be found. He was out before we even started cutting. Smart kid. An hour in, we are still nowhere near completion, and my dining room looks like the inside of a dumpster. Then, as we try to start assembling the tree house, we realize that we cut out the main trunk pieces backwards, so now they won’t fit together properly. The only way they actually fit together makes the tree house look more like a sorry excuse for a rocket ship. “YEAH!” says my daughter, her interest in the project renewed. “A rocket ship!” So now we’re building the world’s very first wood-paneled rocket ship. 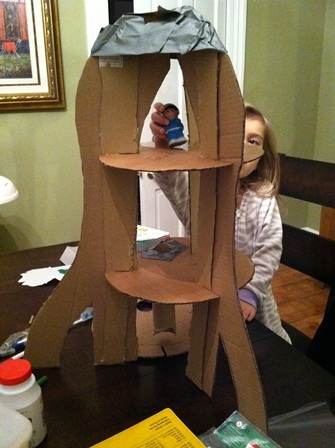 By the time we finally finish – over two hours later – it’s way past the kids’ bedtime, my right hand has become a useless claw, and our tree house/rocket ship, which is held together with duct tape, looks neither like a tree house nor a rocket ship. But no matter, because the kids love it. That is, they love it for the remaining 15 minutes they’re awake. After that night, they never actually play with the cardboard monstrosity again. We keep the deformed tree house/rocket ship around the house for a couple more weeks, solely out of principle, occasionally patching it with more duct tape as needed. After all, I sacrificed over two hours of my life making that damned thing. And I have the claw-hand to prove it. Finally, unable to bear the sight of it any longer, I take the Craft from Hell out behind the woodshed and put it out of its misery. Hopefully my wife will remember this little crafting catastrophe and not subject us to similar “fun” projects in the future. Rest in peace, deformed cardboard tree house/rocket ship. We barely knew ye. 12 Responses to "The Craft From Hell"
Now I truly understand that Cassie is as crazy and ambitious as I thought. (Which I like!) I get these bright ideas as well, and my kids jump ship about 5 minutes in, or my 4 year old throws herself on the floor because “I’m doing it totally wrong”. Then the two year old destroys it and she is equally as upset as when I constructed it. Oh, how I feel your pain. Now that NASA no longer has the Space Shuttle, I’d say that by constructing the first ever wooden rocket spaceship, you and Cassie not only bettered your kids but the entire United States of America as well. Here’s to your Space Shuttle Misendeavor! Cheers. Hahaha! Poor Cassie- trying to be all good mom and you have to rub it in her face with a blog post 🙂 Glad you have some pictures at least for the Craft Hell memory bank! Oh, come on! Crafting IS fun! omg. I laughed THE WHOLE WAY through this blog. My favorite line “I’m a writer, for cryin’ out loud; I’m not used to this type of physical labor”. Who are these people who can replicate FamilyFun craft projects? I don’t think I could be friends with any of them. Can totally relate to this post, esp. your description of family dinners. Dead on. Thanks, Beth. Yeah, my idea of “family fun” is me reading a book inside while the kids are outside playing.